My posts are not intended to be reviews or even book suggestions (unless I specifically urge readers to read a specific book), but often times they inadvertently come off as that. If many of my posts appear as recommended reading I hope people are catching on to the fact that Warren Ellis is an amazing writer. Though at the moment I am getting more and more into Planetary, my favorite Ellis original title is Marvel's Nextwave. 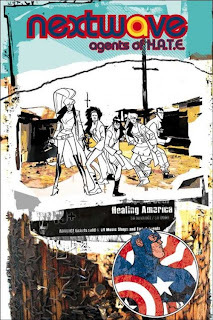 I've written several posts on Nextwave, and I am sure to write several more, but you can tell I like the book when I have now written a post about 25% of all Nextwave existing issues. It mixes humor and superheroes in a way that hasn't quite been done before. I like humor. I like superheroes. I love Nextwave. Nextwave #9 carries on the style of 2 issue story archs by kicking off a tale that pits the Nextwave team, former agents of H.A.T.E., against a bunch of powered people the world has never heard of. The random characters have back stories that link them closely to other famous Avengers: a super-soldier created from Captain America's pee after he was created in 1941, a scientist who was doing stuff with human size while Hank Pym was but spent time double checking his research as apposed to just testing it on himself and others, a kind of angry guy who got high on gamma radiation, and a dude with a bucket like helmet reminiscent of Iron Man. The off-beat super characters tell their stories to the reader in quick "I coulda been a contenda" segments that cut into the Nextwave story nicely. Let me make this clear. I recommend you read Nextwave, and more specifically, Nextwave #9. This comic of the day mocks the idea behind becoming a superhero and how it takes a bit of chance and style to become a famous hero. The book is just fun, as usual. Oh and Warren...call me. We'll do lunch.